I've always loved dressing up for Easter Sunday. It seems that there's less and less reason these days to wear a skirt and heels, so when those opportunities do come up, I embrace the chance to put my best foot forward. On Sunday, I'll be singing in a choir for my church services and then eating an Easter dinner with my family, who I love so much. Oh, and Cadbury Mini Eggs. It's not Easter without them. 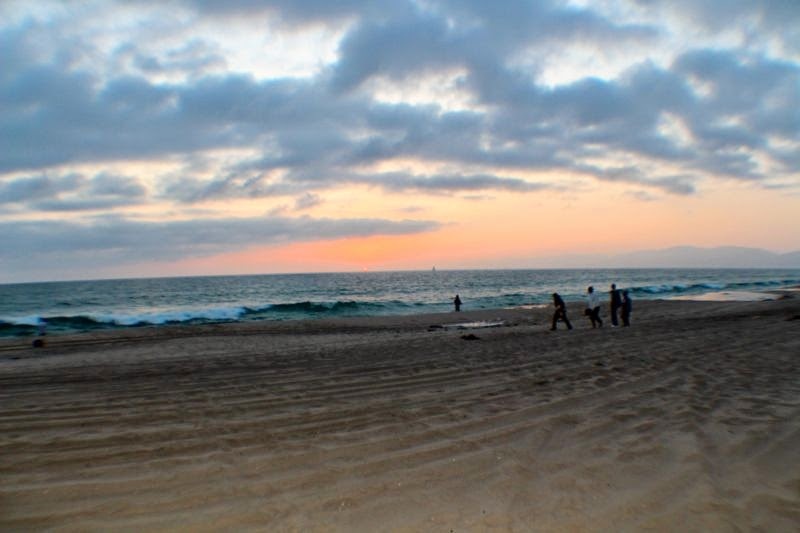 Last night, my friend hosted a bonfire at Dockweiler Beach for her husband's 30th birthday. We roasted hot dogs and marshmallows for s'mores and just enjoyed one another's company. 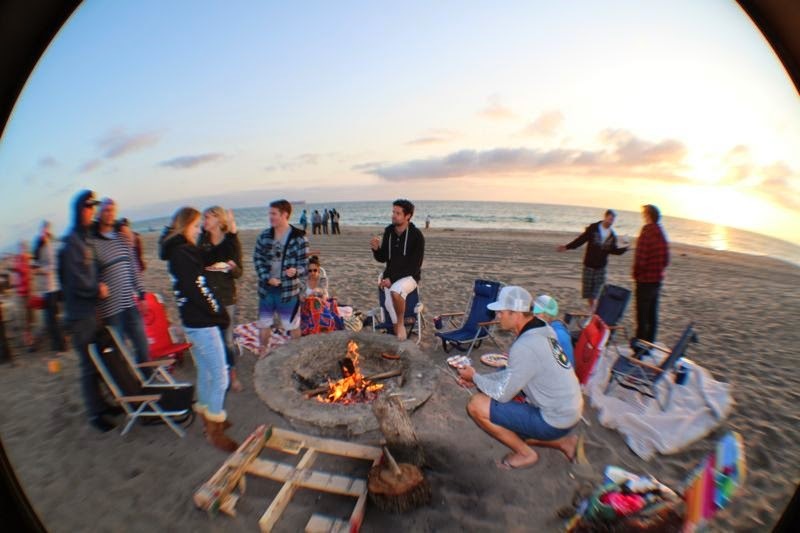 There's something about gathering around a fire with other people that just feels so natural. Add a beach with a beautiful sunset and you'll be hard-pressed to find a better summer evening activity. We always seem to have an absurd amount of ramen noodle packets in our house. 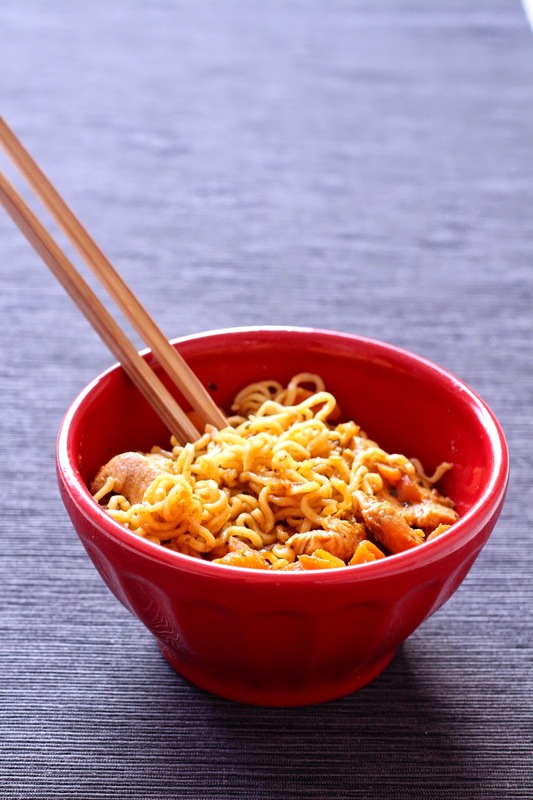 I can't object, because it's the one meal (along with smoothies) that my husband will willingly make for me and boy, he has a way of making simple ramen noodles that make it taste delicious. The other day, I stumbled across this Chicken Yakisoba dish and thought, "Hey! I have all of those ingredients! I could make this!" I changed a couple things from the original recipe and a new classic was born. This is one of those meals that can be changed depending on the ingredients you have in your house. Swap the chicken for shrimp, change the carrots for red peppers. The process stays the same, but the ingredients can vary to keep it fresh. Goodness, I love it when a new dinner staple is discovered! Begin boiling a large pot of water for the noodles. Heat vegetable oil in a large skillet over medium-high heat. When the oil is hot, add the onion powder, ginger, and basil and stir until fragrant, about a minute. Add the chicken strips and cook until they are no longer pink, about 5 minutes. Once the chicken is cooked through, add all of the vegetables. Stir and cook until tender, about 5-10 minutes. Meanwhile, once the water boils, add the noodles and cook until tender, about 3-4 minutes. Drain, return to pot (with the heat off) and toss with a small amount of oil to keep the noodles from sticking. In a small bowl, combine the soy sauce, worcestershire sauce, ketchup, sugar, and crushed red pepper. Stir until ketchup and sugar are dissolved. Pour the sauce into the skillet with the chicken and vegetables with the heat still on medium-high. Add the noodles, stir to coat everything in the sauce, and heat through (just a few minutes). Last weekend, a few girlfriends and I got away for a quick trip to Palm Springs. 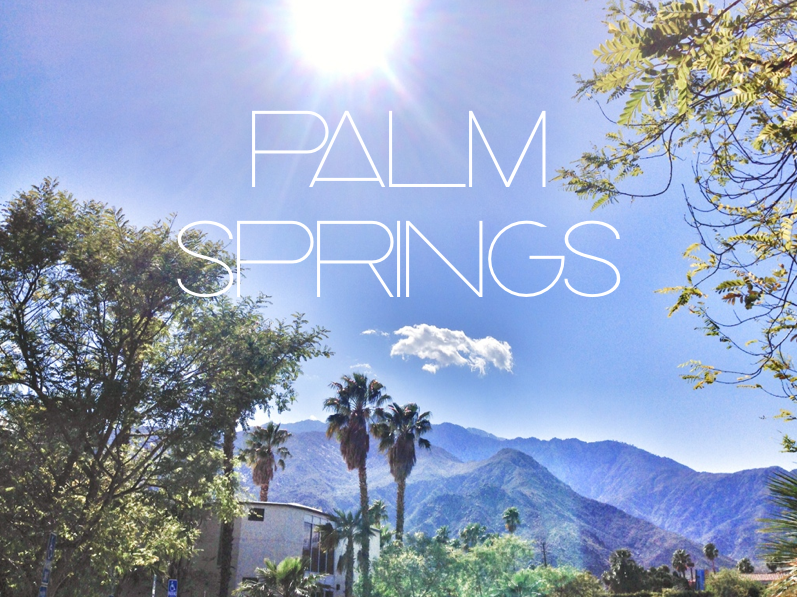 We booked our room through Priceline's Express Deals, and ended up at the Riviera Palm Springs, which was a perfect hotel for what we wanted (our main requirement was a great pool). 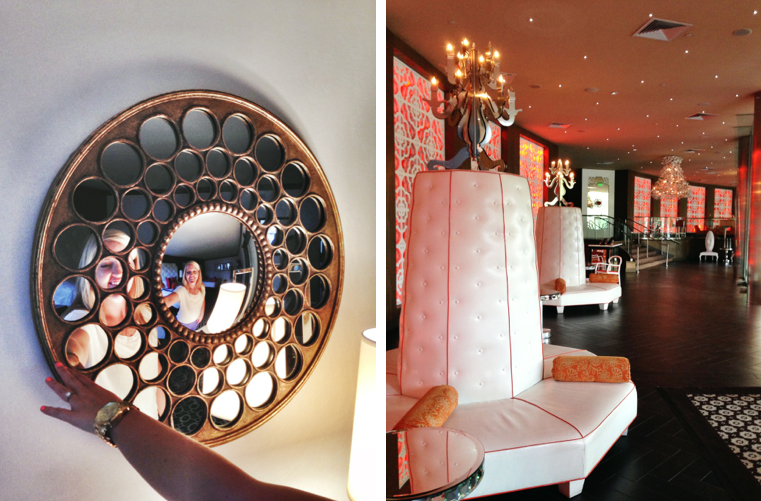 The decor of the hotel had a swanky vibe to it that felt fancy -- perfect for a girl's getaway. We ate dinner at Las Casuelas Mexican restaurant which had an awesome outdoor courtyard patio with a live band playing! After dinner, we headed to Great Shakes for dessert, which is the cutest family-owned gourmet shake shop, offering the most delicious shakes in just about any flavor combination you can imagine. The shakes were divine but what really won me over was the incredibly friendly and happy staff (and the abundance of candy options at the front counter). Oh, and the mini donuts that come wrapped around the straw of your shake -- I almost died at the cuteness of that precious little donut. After a full day in the sun, we stopped by Woody's Burgers before heading home and wow, we all could not stop talking about how amazing these burgers were! I ordered the Western Burger and the way that onion ring collided with the meat patty when I sank my teeth into it was pure perfection! We must have been hungry because there was not a lick of food left on our plates when we walked out of that place. I'm so grateful for the friendships I've developed with great women over the years. When you're married, it's easy to rely on your spouse for just about all of your conversational and social needs. But I've learned that it's important to be able to connect deeply with other women too. That female connection makes me a more balanced person -- a better wife and a happier person. I'm a big fan of delicious baked goods as part of a breakfast spread. I'm one of those girls who can never decide between pancakes or an omelette when I go out to breakfast and I so appreciate when a brunch joint can offer a sweet muffin as a side with my savory omelette. A few months ago, I tried out this recipe for a banana cake. The moist cake has an incredible dense texture and the frosting is actually quite sweeter than I expected, making this a truly delectable treat. Heat oven to 375 degrees. Grease and flour a bundt cake pan. In a large bowl, beat together sugar, sour cream, butter, and eggs until creamy. Blend in bananas and vanilla extract. Add flour, baking soda, and salt, and blend for 1 minute. Stir in walnuts (if using). Spread batter into pan. Bake for 35-40 minutes, or until a knife inserted into the center comes out clean. Meanwhile, for the frosting, heat butter in a large saucepan over medium heat until boiling. Let the butter turn a delicate brown and remove from heat immediately. Add powdered sugar, vanilla extract, and milk. Whisk together until smooth. While the frosting is still hot, spread over warm bundt cake.